Marduk-apla-iddina II (cuneiform spelling ᴰMES.A.SUM-na; in the Bible Merodach-Baladan, also called Marduk-Baladan, Baladan and Berodach-Baladan, lit. Marduk has given me an heir) was a Chaldean prince who usurped the Babylonian throne in 721 BC and reigned in 722 BC--710 BC, and 703 BC--702 BC. 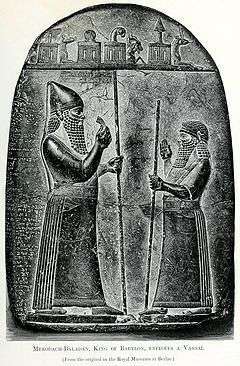 Marduk-apla iddina II was known as one of the kings who maintained Babylonian independence in the face of Assyrian military supremacy for more than a decade. Merodach-baladan is mentioned as king of Babylon in the days of Hezekiah both in 2 Kings 20:12 (here called Berodach-baladan) and in Isaiah 39:1. In both passages he sends Hezekiah a letter of concern because of his illness.